Why a fast, quiet sale probably won't be a good sale | Relatable - Wellington real estate agent with a digital marketing focus. This tells me the margin for error when selling your home is huge. The difference between choosing the right agent and the right process, as opposed to even just average ones, could make or cost you big time. Just how much of an impact are we dealing with? Well, the difference between 70% and 44% (the median Wellington % over RV) is a whopping 26%. How do you increase your chances of getting there? When you interview salespeople to market your home, they may pull out figures showing their results vs. other companies. Disclaimer: I used to do this myself. The issue here is that when I looked at the best sales for each month, there were nearly always 1 or more data entry errors in the top 5 results. What is more telling is that the only error I ever found was an RV being recorded lower than it actually was. (eg. $200k instead of $650k). The only possible reason for this error would be that the agent or their office has entered the land value instead of the full rateable value (although this wasn’t the case most times), pure data entry error or possibly the agency is trying to make their sales look better than they potentially are. 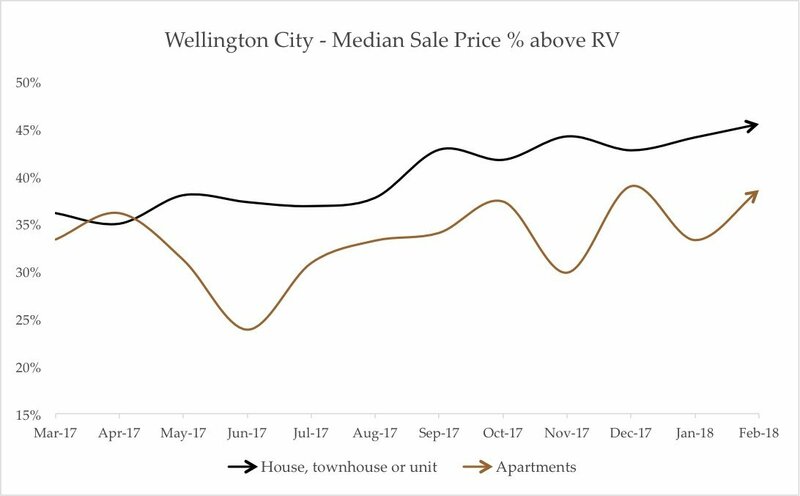 Wellington real estate update – September 2018 | Relatable – Independent Wellington real estate agency with a digital marketing focus.